CHICAGO, Feb. 11, 2019 /PRNewswire/ --Â Assan AlÃ¼minyum's Managing Director GÃ¶ksal GÃ¼ngÃ¶r has been re-elected to serve for a two-year period as the President of Global Foil Roller Initiative (GLAFRI) during the 5th Global Aluminum Foil Roller Conference (GLAFCO) in Dubai, UAE. Mr. GÃ¼ngÃ¶r has been serving on the board of GLAFRI since 2016 and has served as the president since the beginning of 2018. GLAFRI is an international association, with 61 members in 26 countries worldwide (including North and South America, Europe, Asia, Africa and the Middle East), representing approximately 55% of the global aluminum foil production. GLAFRI globally coordinates actions on sustainability in order to support market growth and promote innovative development. "I am delighted and honoured to be asked to continue to serve GLAFRI as its President and hope to continue with the many exciting projects we have initiated," said Mr GÃ¼ngÃ¶r. "2018 was a good year for foil rollers with more than 4% growth worldwide and we will continue to promote our 'One Voice' message to support global market growth and themed messages on sustainability and recovery," Mr. GÃ¼ngÃ¶r stated. 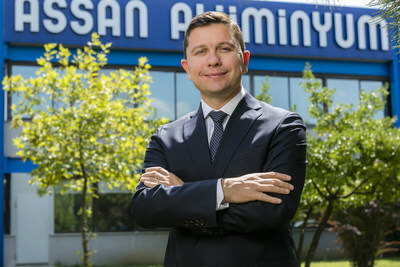 Assan AlÃ¼minyum, one of the 61 members of GLAFRI, is one of the leading aluminum foil producers in Europe, with its aluminum foil production capacity reaching up to 100 thousand tons per year. Mr. GÃ¼ngÃ¶r emphasizes the fact that Assan AlÃ¼minyum makes its future strategic plans based on its sustainability motto of 'Producing the Future without Wasting It'. "The only way to preserve the environment for future generations is through a responsible and sustainable production approach. Therefore we produce renewable energy in our own production facilities, at a rate that is equivalent to our annual electrical energy consumption. Additionally we also process internal and external aluminum scrap in our integrated recycling facility. We are therefore able to reduce our overall carbon footprint as a result of these activities," said Mr. GÃ¼ngÃ¶r. He concluded by stating his commitment to contributing to the advancement of the aluminum foil, its sustainability benefits and the efficient use of resources with new projects during his presidency at GLAFRI.